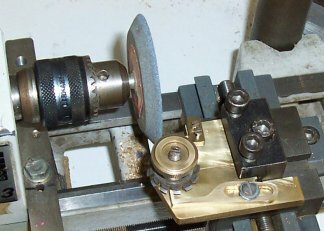 This small grinding jig was made about 18 years ago to be used in my Unimat lathe. 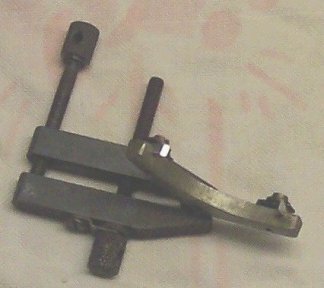 The original one was made from 3/16� brass plate and it was for sharpening multi tooth wheel and pinion cutters and the extra part of the jig fitted to the plate lifted the height to bring the cutters nearer the centre line of the lathe. There was enough room to add an extra jig on the plate which is the subject of this article. I will make a new one from 3/16� brass plate to give you some photographs to show how easy it is to make and also to show what a useful tool it is. First square a piece of plate and drill a 1/8� or 3mm hole on the scribed lines. Cut the plate on the lines drawn and use a file to tidy up. The long edge has to be made as flat as possible or even concave so that when it is put into the tool post it will not rock on the inside edge of the tool holder. The hole in the junction of the corner is to allow the plate to be taken from the tool post to check the progress of the grinding and be replaced in exactly the same position without any fear of grinding dust altering the settings. I always have a small paint brush handy to wipe away any grit or dust that might alter the setting. Centre punch on the mark in the drawing and tap 8ba for one of the clamping screws. The next part to be made is the clamp from 1/8� brass plate, mark off from the drawing and center punch, ready for the drilling machine. The front hole is to be drilled 2-2mm for clearance 8 ba and the other hole is drilled 1-8mm for tapping 8 ba. When the clamp is made you can fit it onto the main plate and drill a small depression where the other 8ba clamping screw will bear onto the plate. This will stop any tendency for the clamp to move when tightening up. 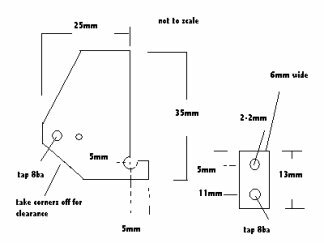 The clamp is nothing more than an engineer�s type with one screw working against another to hold the item being worked on. To use the tool is very easy but care must be taken when setting up. 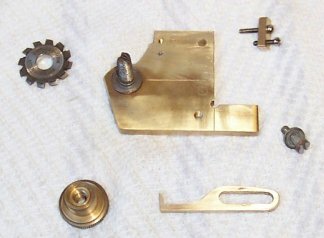 When working on Vienna type clock movements or any other dead beat clocks that have adjustable pallets they often require the locking and impulse surfaces to be made good. Check the clearances etc and if you are sure that the settings have not been tampered with proceed as follows. I use a dial type caliper and use the depth gauge to measure the distance from the nib of the pallet, to the body of the pallet frame and write it down and keep it safe until the job is done. Remove the pallet from its frame and install in the jig using the clamp so that the acting face of the pallet is exposed (over) the edge of the plate. Install the jig in the tool post and make sure the jig is against the inside edge of the tool holder. 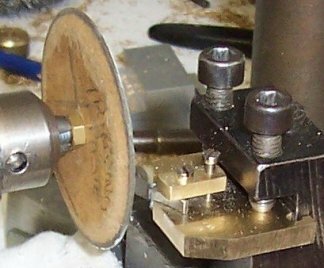 Install a fine grinding wheel in the lathe chuck and by eye line the impulse face to the grinding wheel so they are parallel, (moving the tool post to find the best position). I normally use a visor type magnification for workshop use but for this job I like to use an eye glass and make sure that the pallet is in the clamp correctly and lined up to the grinding wheel. Take small bites at the grinding wheel say 2 thou at a time until you think that all wear is removed and check by taking the jig out of the tool post for a clearer view. When you are satisfied that all wear has gone replace the grinding wheel with home made laps of finer grades of wet and dry paper and finishing with a hard wood lap charged with metal polish. The pallet should be as good as the day it left the factory and all that remains is to install it back into the pallet frame, using the dial indicator to position it correctly. Grind the other pallet and when fitted back into the frame you can install the assembly into the clock plates with the escape and third wheel and test for a good action with correct locking etc. 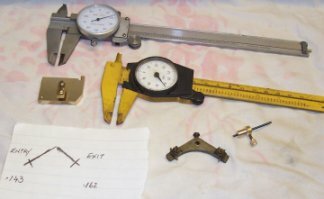 It just occurred to me that many people have metal dial gauges and these can become heavy for this sort of work so I will show a simple jig that will give you the same sort of accuracy. Take a 3/8� diameter piece of brass rod and drill say 1/16� for a depth of �� and part off. Take a piece of 1/16� blued pivot steel and round the end with a pivot file and burnish. Drill a hole into the brass rod for tapping an 8 Ba locking screw and use the device to obtain the pallet depth. The gauge that I use for this job is made of a composite material and is light in use but is well past its working life using the normal jaws but is still good for using as a depth gauge. The jig is not hard to make or use and takes all the guess work out of this particular part of clock repairing. 1/ The original jig used for sharpening multi tooth cutters and pallet grinding. 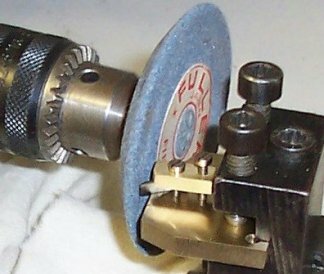 2/ Jig in cutter sharpening mode. 3/ 2x Dial gauges and an easy made depth gauge. 5/ The final polish using wood lap. 6/ Pallet face is polished as good as new.